It always gets hotter in the afternoon in this office. I don’t know whether the air conditioning is just tired, or the whole building is warming up after a day’s sunshine, but around 3pm it starts to get a little stuffy. Today, joyously, it’s 3pm, I’m wearing a jacket, and I’m comfortable. 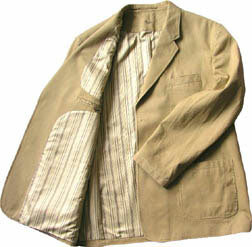 The jacket is unstructured, cotton and half lined. It’s the lightest jacket I’ve ever worn by some distance – indeed, many would refer to it as a shirt jacket, I believe. But it’s produced an alternative to The Logical Waistcoat Theory. For those who missed the original post on this topic, the problem addressed by the Waistcoat Theory was that air conditioning and central heating have made the jacket, whether suit or odd, largely redundant. Office workers take off their jacket when they get in, put it on the back of their chair and only put it on again when they go outside. Indeed, they might not even put it on then if it is a warm day; and if it’s a cold day they might prefer an overcoat. The jacket is rarely worn, meaning that the suit is rarely worn in its entirety and loses many of its flattering aspects. There is also more pressure on the shirt fitting well, the tie is dragged out of its normal position and loses a little of its elegance, and most depressingly, people just don’t wear jackets – probably the most satisfying and defining aspect of menswear. The advertising for suits looks a little silly all of a sudden, given that men only wear that full outfit for a small proportion of their day. The waistcoat is a possible solution, as it is easier to wear all day long. It is elegant, keeps the tie tucked in, lengthens the silhouette and can be worked in at a desk quite comfortably. The lighter jacket is another solution; one which is likely to find greater appeal I’m sure, given that some still have prejudices against the waistcoat. These half-lined jackets have been quite prevalent the last two summers, and can be picked up at many of the top-line retailers. Mine was found in the summer sale at Aquascutum, in navy and double-breasted. Despite only being sold in the summer, these cotton jackets should be worn the whole year in my opinion. The key is for an office-worker to think of his outfit in two senses – what he wears inside and what outside. The cotton jacket is a way to make the inside outfit more dressy and flattering, as is the waistcoat. Outside an overcoat or not can be added depending on the weather. You can follow the discussion on The logical jacket by entering your email address in the box below. You will then receive an email every time a new comment is added. These will also contain a link to a page where you can stop the alerts, and remove all of your related data from the site. I’d be curious to hear your suggestions on what to pair these jackets with. I have one in navy and one in dark grey, but jeans are about all I wear them with. I have trouble matching their not-so-dressy look with dressier office wear. Thanks! Matt. Hi Matt – the key in my opinion is to contrast the textures, so a cotton jacket like this works well with wool trousers, just like woolen odd jackets, which I generally prefer with cotton trousers (whether chinos, jeans or cords). Best to go with rougher wools with these cotton jackets to be on the more casual end – flannel or any heavier-gauge wools. I have a question about tailors, and suits, and different styles of them. In your post today, you say the light jacket would have been hard to get at a tailor “used to worsted suits and little else” and to me this would imply that you have one tailor for all suit purposes. Is this the norm, or are do people choose different tailors depending on what type of clothes they need – the way I’d shop for office attire in one place, gala frocks in another, countrywear in a third? Hi there. I think most people would use their tailor for this kind of jacket, or would use their shirt maker if they have one, given that the jacket is so unstructured it almost has more in common with a shirt. However, as my tailor is in Hong Kong and English is not his first language, there are certain things I would not attempt to try and explain to him, especially as I think there is a good chance he has never made this kind of shirt jacket before. I’m sure most other tailors could do this for you, certainly on Savile Row, and most people would use just the one. Also, if you want to know more about my tailor and the process of managing one, I suggest you search for the term ‘tailor’ on this blog or look at the section on the right entitled The Suit.